But how to organise all those new purchases? Yes! London Fashion Week is just around the corner, providing the perfect excuse for a complete wardrobe overhaul! But after the shows, shopping and cocktails have finished and we’ve managed to lug all our bags across town, we still need to figure out where on earth to store it all once we’re back in our lair? As any dedicated fashionista will tell you, it’s not just about having enough drawers, oh no. What we want is to be able to admire the fruits of our labour and to display or collection of fashion forward picks to others. We want to have everything at our finger tips and in our line of sight to make getting ready quicker, easier and well, altogether more joyful. Start with a good sort through all your clothes, shoes, bags, jewellery and so on. You don’t want a space full of items you will never wear. Next, think about what’s important to you. If you’re a shoe addict, think about how you would like them stored and displayed – do you want them on show or wrapped away for protection? Do you need lots of shelving for shoe boxes or do you prefer the shoes out of their boxes on display? Have a think about lighting. Make sure the space is well lit, especially where you have the full-length mirror for trying outfits on. Using back-lit shelves can be a nice touch here, especially if you have a designer handbag collection or hats to display. Made to measure shelving can also work wonders for those items. Then, give some thought to space allocation for clothes. Do you have more long dresses than separates? If so, you’ll need more full height hanging space. Be realistic about your level of tidiness as well. If you’re super neat, then open shelving and hanging space can work well, but if you lean towards the messy, then doors to hide away untidiness come highly recommended! Decide on style. Do you want your dressing room to be glamorous and glitzy, sleek and cotemporary, or vintage inspired? Shape the space and the items on display to fit your preferred style. Add some practical touches. Drawers can be a great help as underwear, ties and jewellery can all be neatly stored away, while a safe for expensive jewellery and watches may also be a good move. If space allows, a central island with further storage can also be very useful or can provide an area for sitting. Finally, if you have oodles of space available, then a ‘his and hers’ dressing room is the ultimate luxury touch. With our side being ever-so-slightly bigger…of course! Renowned interior design company Alexander James Interiors has announced the launch of its brand new IMPRSS service. The 2015/16 English Housing Survey revealed that 20% of all households now rent privately, meaning that the PRS has doubled in size since the 10% of the population that it accounted for throughout the 1980s and 1900s. Renting is particularly prevalent among younger people, with 46% of 25 to 34 year olds renting privately (up from 24% just ten years ago). It was the needs of these young renters in particular that first gave rise to the idea of IMPRSS. Rental properties require robust furniture and furnishings. The IMPRSS team is demonstrating that that doesn’t have to be at the expense of style. The IMPRSS brochure details five contemporary design options that private landlords can use to ensure that potential tenants are queuing up to live in their superior accommodation. By tapping in to the aspirations of Generation Rent, IMPRSS is enabling landlords to maximise rents while minimising void periods. By seeking out low maintenance furnishings that are durable yet low maintenance, IMPRSS is also ensuring that upkeep costs are kept to a minimum. The IMPRSS service is available to PRS property holders across the UK. As well as furnishing PRS homes, IMPRSS offers a range of bolt-on options, in order to deliver a full service. These include electrical goods, kitchenware, pictures and mirrors, soft furnishings (towels and linen) and accessories. There are even free extras for landlords who purchase all five bolt-ons, including Nespresso machines and Sonos Play 3 systems. For more information, visit IMPRSS at www.imprss.co.uk or call 020 3362 0472. Holidaymakers are more likely to rent a property if it looks good, so it’s important to take care when furnishing and styling a holiday home in order to maximize its rental income potential. Are dogs are allowed? 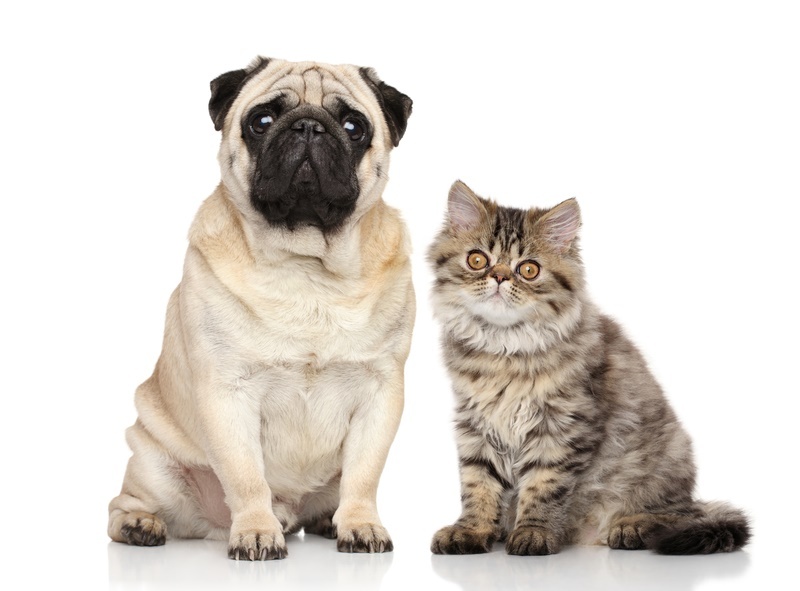 There are plenty of people with dogs in the UK who want to take their furry friend away with them. Nice linen. The White Company bed linen and towels, with wool throws and cushions is ideal. Tech. That includes iPod docs, Sonos sound systems and TVs with freeview and Netflix. Wi-Fi. This is a non-negotiable in this day and age. Kitchen comforts. Holidays should be about relaxation and doing as little as possible, so dishwashers, Nespresso machines and the like are rapidly becoming essential. Good quality china and glassware. Chipped and scratched Ikea white plates won’t cut it! Outside space. This should ideally include a BBQ area with plentiful seating. A welcome hamper. These are becoming increasingly common, with guests expecting a few essentials upon arrival (wine, bread, milk and butter as a bare minimum). Owners who can tick off all ten of these are onto a winning combination, but their work still isn’t done. “Think about your furniture layouts. Is it a two bedroom cottage that sleeps four? Then make sure you have enough seating in the lounge for four people without it being overcrowded. Styling a holiday let as a boutique-style retreat that looks amazing in photographs will set it apart from the competition and enable its owners to charge a higher rent. Therefore, when taking photographs of a holiday property, it’s important to use props to stage it. For example, don’t just take a picture of the bathroom – first light candles around a bubble-filled bath, add a few designer beauty products and place a stack of big, fluffy white towels in the shot. In the kitchen, dress the table with cream teas. Beds are a quick win here too – use plush-looking linen, throws and cushions, then add a breakfast tray complete with croissants, jam and fresh orange juice. The key is for owners to ensure that anyone viewing the photographs will instantly be able to imagine themselves in the property. Those lacking in inspiration can look at holiday let websites like Unique Homestays and Boutique Retreats for ideas on how to style their photographs. The Alexander James Interior Design team would also be happy to help! For more information, visit Alexander James Interior Design at www.aji.co.uk, email info@aji.co.uk or call 020 7887 7604. Newly published NHBC figures show that the number of new homes registered in the first three months of 2017 have shot up by 17% when compared with the Q1 2016 figures. In total, more than 42,000 new homes were registered between January and March 2017, making it the best quarter for new home building in a decade. The figures have been released in advance of #NewHomesWeek, which runs from 15th -21st May to celebrate the benefits of buying a newly built residence. There are myriad advantages to doing so and the interior design potential is one of the most exciting. The professional interior design team at Alexander James strongly recommends starting with a mood board, with sections for each room. That way, the home’s overall style can be considered at the same time as that of individual rooms. 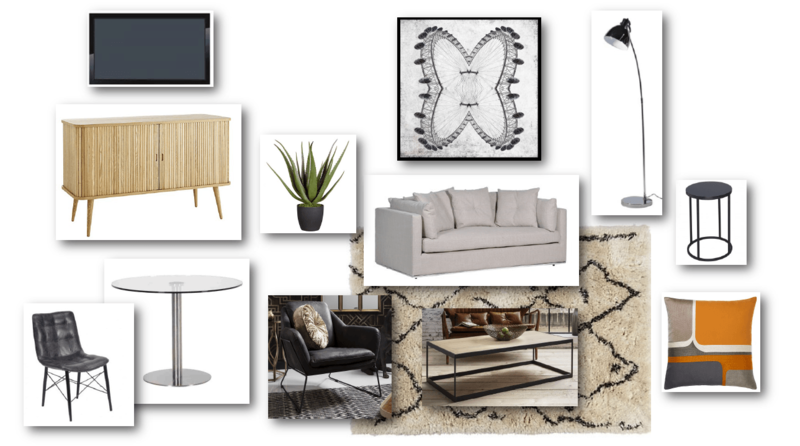 Mood boards are a great way to bring shape to your vision. Bring together everything that has caught your eye, including wallpaper samples, images of pieces of furniture, fabric swatches, artwork examples, striking cosmetic bottles and more. You can then compare and contrast all of these items, considering what works best and shaping your vision for your new build home accordingly. When it comes to colours, choosing a palette of neutral shades and complementary hues, along with a few bolder accent colours, is a great start. These can be applied throughout the home and will help to create a sense of harmony, with one room flowing beautifully into the next. Bringing nature indoors is a great way to do just that. The natural world can do wonders for our inner sense of peace, so large leaf prints, vases spilling over with flowers and the presence of natural elements in everything from lamps to tables is a great way to bring serenity into the home. It’s also perfectly attuned to this summer’s hottest interior design trends. Incorporating natural elements is also a great way to dress your home for the nose, as well as the eyes. The scent of freshly cut flowers can bring a room to life. Scented candles and reed diffusers are also a wonderful way to create rooms that feel harmonious and welcoming. This was demonstrated wonderfully at Lockeswood in Eversley, a new build property dressed beautifully by Alexander James Interior Design. 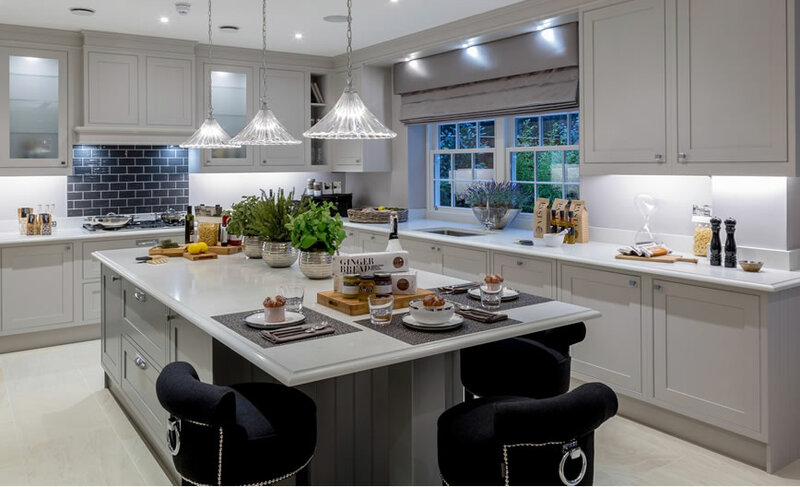 The final tip from the Alexander James team is to involve younger family members in the process of interior design when it comes to new build homes. The most exciting event of the gardening calendar, the RHS Chelsea Flower Show, is set to take place on 23-27 May 2017. This year’s show is seeking to be “the best gardening event in the world,” according to RHS Director of Shows Nick Mattingley. It’s a lofty goal, but one that is also realistic. The Chelsea Flower Show inspires millions every year and influences everything from bouquet trends to interior design. The inspirational blooms and scents of the Chelsea Show won’t only appear in people’s homes via their TV screens this year. Interior designer Stacey Sibley has worked alongside Clifford on a number of key projects for Alexander James Interior Design. While Clifford takes care of exterior elements, Stacey has identified the influences of nature as the big interiors trend this summer. Finishes, colours and textures all hark back to nature, along with dramatic floral prints and, of course, huge vases of stunning blooms. ‘Greenery’ is Pantone’s colour of the year for 2017, resulting in plenty of green in the interior world. Designers are also poised and ready to absorb the most beautiful elements of the RHS Chelsea Flower Show into their creative vision as the spring turns into summer, with interior design reflecting the best that the RHS show has to offer. Those lacking the green fingers to compete at Chelsea – or even to keep a guzmania alive – need not despair. Stacey recommends faux plants and silk flowers for capturing the essence of nature without the risk of browning leaves and wilted blooms. John Lewis has an extremely well-priced collection at present, including some delightful metallic pots, which Alexander James’ Stacey Sibley has flagged as another of this summer’s top trends. Art lovers are in for a treat this year, with London’s Lisson Gallery celebrating its 50th birthday with a magnificent series of exhibitions and events. The National Gallery – the UK’s most visited gallery, with well over 6.2 million visitors in 2016, according to the Association of Leading Visitor Attractions – is also offering something special, with Cagnacci’s Repentant Magdalene, the Michelangelo and Sebastiano exhibition and a Rubens and Rembrandt feature all running concurrently. However, if we are to believe the words of Edgar Degas, then “Art is not what you see, but what you make others see.” It is a concept that is familiar to every successful interior designer – those with the powers to make others see an overall vision that is greater than the sum of its parts. Having worked in interior design for 24 years, Alexander James’ Stacey Sibley is well versed in finding the right artwork to tie together all the elements of a room, from fabrics to colour palette to furniture. Art can both echo the theme of the room and inspire it. This Beaconsfield family home, dressed by the Alexander James team, displays the concept beautifully, with artworks reflecting the colours, textures and themes of the rooms in which they feature. For those looking for a uniquely artistic home, engaging the services of a local artist can be a wonderful way to obtain bespoke artwork. Furnishing the artist with a swatch of cushion fabric, key colour samples or a mood board can allow him or her to draw together all aspects of the design. In the Beaconsfield home, for example, the open plan living room features beautiful, bespoke artwork designed to fade from bold to light and inspired by the accent cushions, which feature a bold oil painting inspired fabric designed by artist Jessica Zoob for Romo. Nor is it just private homes in which art plays an important role. Working closely with developers has emphasised to the Alexander James team how essential artworks are when dressing show homes. At Landmark Place in London, their interior designers embraced the use of art by purchasing a limited edition Damien Hirst print for the show home. 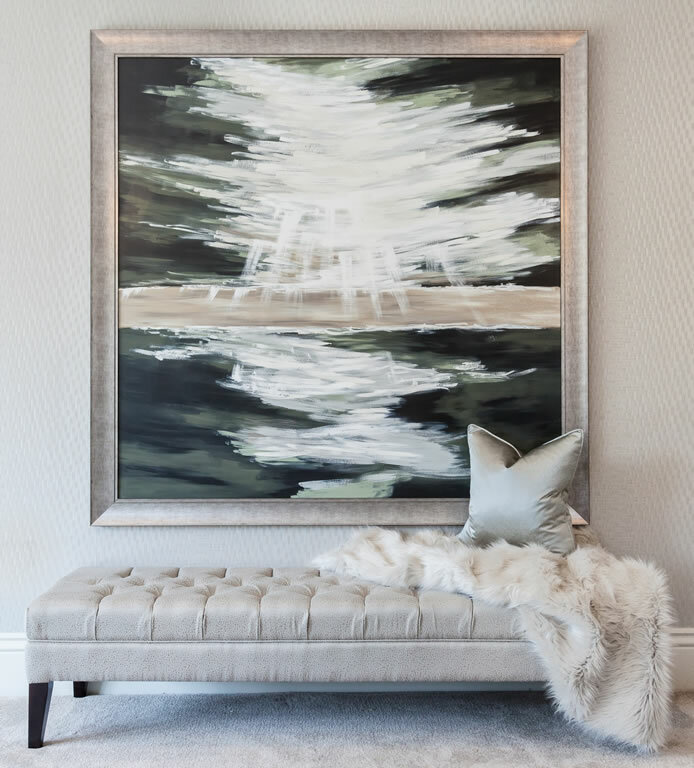 ‘The Souls III’ is one of a 15-piece signed edition purchased by Alexander James Interior Design as part of their dressing of the stunning new show home. The print is currently on loan to Landmark Place’s developer, Barratt Homes, enabling art to be taken to the next level in show home design. Whether it’s a Damien Hirst print or the work of a talented, up-and-coming local artist, placing art perfectly is almost as important a skill as choosing the right pieces, according to Alexander James’ Stacey Sibley. She recommends balancing art and furniture by aligning artwork with a sideboard or console table and bordering it with side lamps to highlight it. The right framing is also essential, as is balancing the frame with the lamps and other furniture around it. Hanging artwork at the right level is also essential. The centre of the image should ideally be at eye level. However, for informal seating areas, hanging the artwork low will make the space feel more cosy and intimate. Hanging artwork in clusters can also work well. “Gallery walls are a great way to occupy vast and open wall spaces, especially stairwells which are usually quite bare. Grouping several frames in various sizes, styles and orientations gives a really creative look and allows you to add more whenever you like. Spring is well known to be the best time of year to sell your home. In fact, research by US firm Zillow found that homes listed for sale between 1-15 May sell an average of 18.5 days faster than those listed outside of that time period, as well as achieving a 1% higher sale price. For those planning to take advantage of the spring sales season, the experts at Alexander James Interior Design have shared their top 10 tips for selling your home faster through creative interior design. Start by casting a critical eye over your home yourself, picturing it through the eyes of a potential buyer. Try and think about the tastes and requirements of the type of person who might buy your home, whether it be a family of six or a couple without children. If it is a family home, you may gear your changes towards a family-friendly layout. A fresh coat of a neutral paint colour can work wonders. Use it where needed to cover up more controversial colours, which could put off potential buyers by restricting their vision for the property. If carpets look tired, tatty and threadbare, it’s a good idea to replace them, if your budget permits. At the very least, professional carpet cleaning can make a huge difference when it comes to brightening up a room. Make the most of every inch of drawer, cupboard and wardrobe space that you have by removing unnecessary clutter. This will open up the space and leave room for the imagination. If you have somewhere to store it, you can even remove two or three pieces of furniture from each room, to really show your home’s features and create a spacious feel. In the kitchen, clear away toasters and kettles to give a clean finish to the room. You’ve likely spent years personalizing your home to perfection. Now it’s time to undo your hard work! Eliminate personal effects so that your home becomes a place where potential buyers are able to envision themselves living. In particular, replace photographs with more generic artwork. Gently accessorise to make your property feel like a home. Use a soothing colour palette to allow one room to flow into the next, creating a cohesive feel. Adding fresh flowers injects colour and warmth to a room, while green plants can add a contemporary touch, creating a feature within a living space. High end magazines can be displayed on a coffee table for a homely effect. Soft furnishings are important and the use of luxury brands can really make a difference. While the brands themselves are unlikely to be noticed by the potential buyer, the overall impact will be to add a quality effect. Any garish colours or worn cushions should be replaced, creating a home that the prospective new owners can feel a sense of pride in. Homes should have bright lighting to awaken the buyer’s senses. Good lighting can make your home feel more spacious and enhance its features. It may be worth investing in some brighter light bulbs (but not so bright that rooms appear clinical!) for maximum impact. Use beautiful scented candles and diffusers throughout the home, but most importantly in the living area, master bedroom and master bathroom. Studies have found that complex scents can distract a buyers thought process, so we recommend simple, fresh scents such as orange, lemon, pine, basil, cedar, vanilla and cinnamon. Cast your eye over your home once more and stage it like a show home for every single viewing. There shouldn’t be a dirty teacup or overflowing basket of washing in sight! Staging your house like a show home will allow potential buyers to feel that it is a property they would be proud to own. Beautiful interior design doesn’t happen overnight. 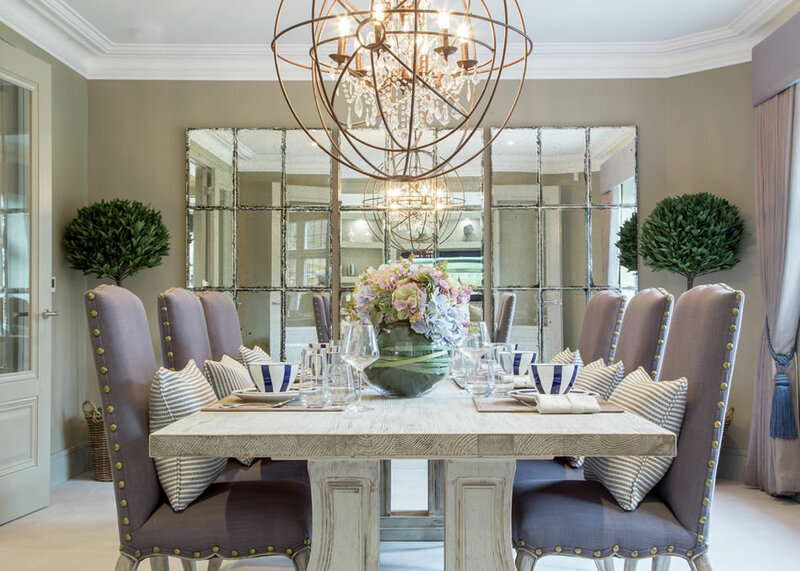 In fact, Creative Director Stacey Sibley has dedicated the last 17 years to Alexander James Interior Design, the award-winning company delivering the most stunning interiors to the UK’s show houses, private homes and rental apartments. Having trained in graphic design and styling, Stacey began her career at an interior design company that specialised in show homes. Her passion for creating beautiful properties led her to Alexander James Interior Design in 2000. What began as membership of a team of five has evolved into Stacey heading up a department of 22 designers, while the Alexander James group has expanded to employ more than 100 staff in total. Much has changed as Stacey has grown and developed with the Alexander James team. She is now responsible for the creative side of the business, overseeing designers and managing creative direction, as well as undertaking design work for key clients and keeping up with the latest industry trends. Here she shares her highlights of the experience. Why is your role essential to the process of delivering stunning interiors? At Alexander James I oversee the creative teams and the smooth running of the design studio, ensuring we deliver the best possible result on every project, as well as undertaking design projects myself. My role blends both creativity and organisational skills, which don’t always go hand in hand! That combination of skills is essential to delivering stunning interiors, particularly when it comes to show houses, which have to be incredibly efficient and deliver smooth installations that run to deadline. I have quite a varied taste, which has changed over the years. For my own home, I like a relaxed style with a mix of old and new. 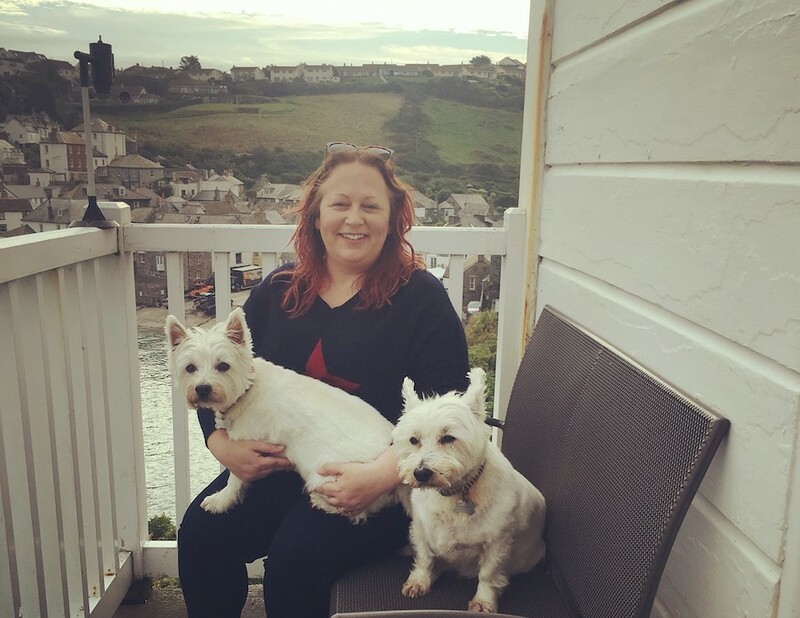 I’ve developed a homely feel that encourages me to unwind and that perfectly suits my family and my two gorgeous Westies, Alfie and Piglet. I’ve opted for soft colours, as I need a calm sanctuary with plenty of light. I love styling and finding one-off pieces from vintage shops. How has interior design changed since the start of your career? Quite a lot! A good example is window treatments, which have changed massively – they’ve gone from Austrian blinds, chintz, big bows, swags and tails to clean lines, and crisp, functional finishes. The days of matching wallpaper and fabrics are also thankfully long gone! In recent years, we’ve seen a shift away from chrome, which was everywhere five years ago. We’re also seeing the resurgence of gold, which is now being used in a contemporary way, along with copper, brass and rose gold. The mixture of using traditional, rustic woods with modern metals has been a big change in the past few years as well. Most recently, it was The Chapel at Mill Hill, North London. The vast, vaulted ceiling and huge open living space meant that it was a challenge to make it feel like a home rather than a chapel! It also threw up some interesting challenges in terms of getting the scale of furniture and artwork right. It was a fascinating project to work on, but it did have some very unique challenges. The different finishes – lots of marble and stone – also meant that we had to think carefully about the acoustics in order to produce a warm, homely feeling rather than a chamber full of echoes! Which is your favourite room to design? Each property is unique, so I don’t have a preferred room, as such. My favourite types of rooms are those that are an awkward shape. That might be a kitchen in one property and a guest bedroom in another. The challenge of overcoming the spatial complexity is very rewarding. What are the top trends to look out for in the years ahead? Things now going more into natural elements – bringing nature into the home. Olive green is big this year and we’re seeing muted pinks coming back as well. We’re also finding that clients are keen for quite an eclectic feel at the moment, which looks like a trend that will develop further over the years ahead. It’s about mixing the old with the new in order to achieve a more ‘lived in’ look. In terms of particular objects, Tom Faulkner’s Odessa cabinet is just beautiful and very on trend – the geometric lines and inlaid bronze are simple yet stunning, and a great example of the future of designer cabinetry. Is there anything that one should always avoid when it comes to interior design? There are several things, but top of my list is making rooms feel dark and oppressive. Rooms should be light, bright and airy, not crammed with oversized furniture and so many dark colours that they make you want to leave the moment you walk into them! What’s your secret quick win for those looking to transform their home on a budget? Paint! Light, bright walls can completely transform a room. Just make sure they match the colour palette of the furnishings and artwork already in the room, it the walls are the only element being changed. Finally, what are your top three interior design tips? Firstly, look at the space and plan furniture scales correctly – don’t assume anything! Measure the room and check dimensions carefully, as well as thinking about the use of the space. Beauty has to combine with functionality and provision needs to be made for storage as well. Next, let textures be your friend. Enjoy the variety available and be playful with them, layering contrasting fabrics and finishes in order to avoid too much of any one texture. Lastly, think carefully about lighting. There’s such a huge variety of lighting options available and each can influence the overall feel of a room. Plan the lighting just as carefully as all the other elements to be sure it will work as part of the overall vision. 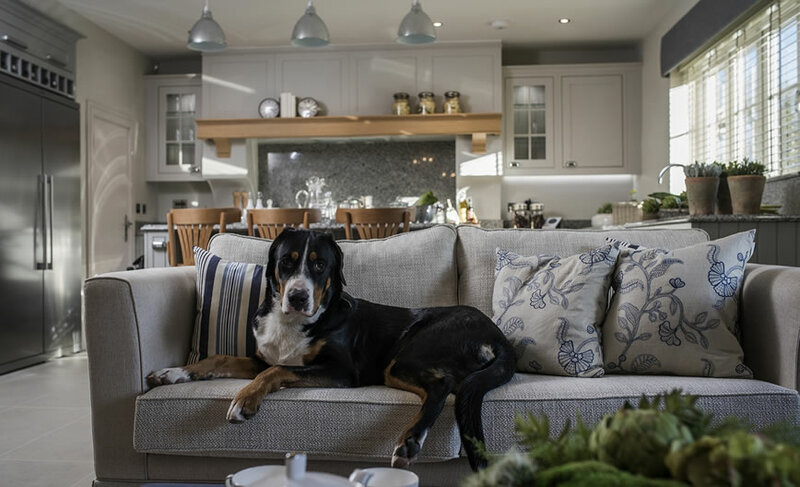 With spring sales in full swing in many shops, now is the perfect time to take a critical look at your home and make a few changes to bring it up to show house standard. The first top tip from the interior design experts at Alexander James is to declutter. Achieving show home style in your living room won’t happen if there are toys strewn all over the floor, clothes drying on radiators, or newspapers and wine glasses piled up on the coffee table. Whether you tidy it away, or go one step further and get rid of some of the clutter by selling it or donating it to charity, it’s time to reduce the number of items that are visible – and then make those that are left count. Thinking about your colour scheme is the next step. A base of complementary neutral tones, with a couple of brighter colours for contrast, will help to create a warm and cosy yet stylish environment. For those who aren’t naturally good with colours, the Alexander James Interior Design team recommends using a colour wheel, as well as creating a mood board to start brining your ideas to life. Mirrors have the added benefit of being able to make rooms feel more spacious, if positioned well. 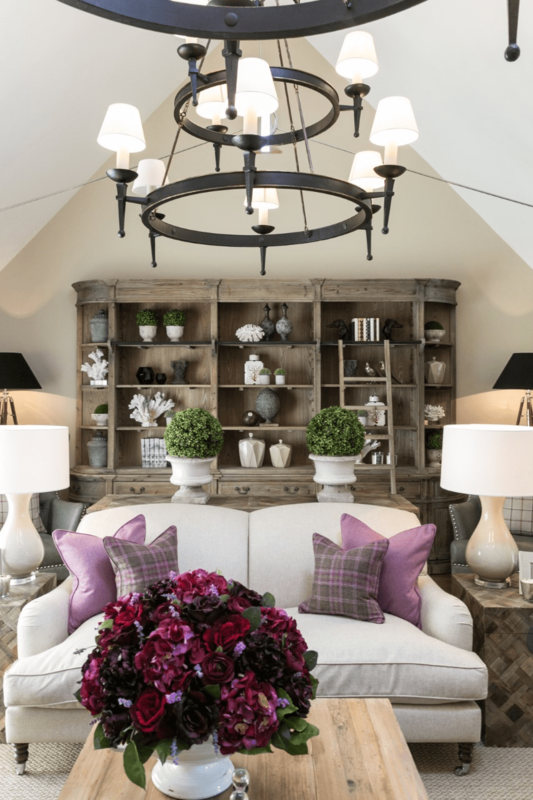 Lamps and candles can also be used to achieve show house style in your home, and a variety of lighting options means that a space can go from feeling bright and airy to comfortable and cosy as evening approaches. The fourth tip from the Alexander James team is to compare and contrast fabrics and textures. If your sofa cushions are velvet, don’t opt for velvet cushions and velvet curtains – contrast the fabrics while maintaining a complementary flow of colour. The same is true of other textures. Pair painted wooden chairs with a natural wood mirror frame or cluster of photo frames. Soften the sheen of metallic cabinet doors with jam jars or pitchers full of delicate, tumbling flowers.